Team challenges are run in a leaderboard fashion based on averages. The team with the highest step average moves to the top of the leaderboard. Because scoring is based on team averages, it doesn't matter how many people are on each team. 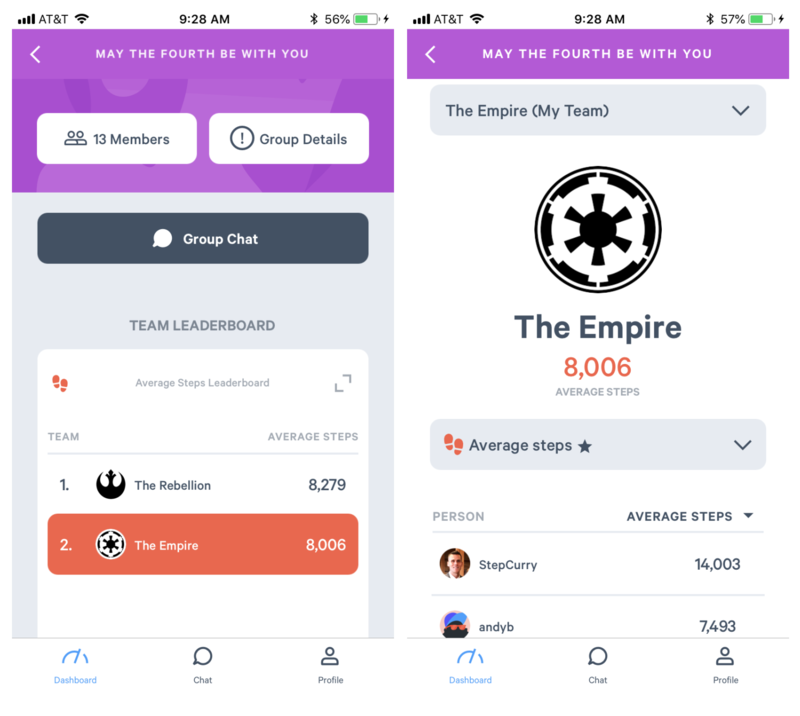 Participants in a team challenge will be able to see a leaderboard of teams (below, left), and a leaderboard of their own team members (below, right) . 1. Fill in the group name, description, prize, and dates. 2. On the next screen, scroll to "Advanced Challenge Modes" and select "Team Leaderboard" as your main challenge module. 3. Select either steps or active minutes as your metric and hit "Next". 4. Add any additional modules (at least 1) and follow the prompts to fill in any additional step goals, if applicable. 5. Review your challenge, hit Finish, and you are good to go! 6. Copy the challenge link now, or head to the new challenge group to copy the link and add it to your on boarding communication. To view and use one of our team challenge announcement templates, click here. If you've allowed users to create their own teams (Ultimate Plan only), they will be able to create teams up until the challenge begins. Users looking to join teams will be able to search for teams by name, sort alphabetically, or sort by spots left on each team. Once a team is full, it will still appear in the list of teams but new users will not be able to join that team. All users will be allowed to switch teams up until the challenge begins. Once the challenge starts, users will have to contact you to move to a different team if they are on the wrong one. You remove users from teams, and add users to teams in the admin center before and during the team challenge. Have fun, and let us know if you have questions about structuring or running your team challenge!